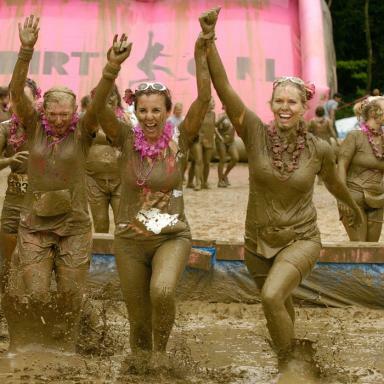 Being active in a fun way is what Mud running races are all about. I have had a chance to participate in wacky world mud running event and believe me its the most enthralling and funny race that I have ever participated. Running and playing in the mud might pick interest of some fitness runners but it also fascinates fun and challenge loving people like me who are drawn in for the physical and mental challenges that the mud racing offers especially the obstacles that comes during the race. I have participated in a 5k long course racing with a few of my friends. we scaled walls, crawled through the narrow tubes and went under wires and it was so much fun agile way to keep yourself fit that you can realize only when you participate in the race. The second part of the race was also great which was basically an after-race party event. Here’s once advice for the first time participants, pls do carry one pair of additional cloths unless you don’t mind attending the party doused in mud. Delicious Food, beverages, rides, live bands and unlimited pint of beers with friends, there was all the things that kicked off one of a kind celebration. The air that most Americans breathe may not be as clean as they think — depending on where they live, at least. Roughly 60 percent of Americans live in areas where air pollution has reached unhealthy levels that can make people sick, suggests the 2009 State of the Air report released today by the American Lung Association. The 2009 report was based on data collected at some 900 monitoring sites across the country during a three-year period from 2005 through 2007. Researchers measured the air quality of different areas using three criteria — long-term particle pollution, short-term particle pollution and ozone concentration. All three forms of pollution have been shown to have negative health effects. The bloody swine influenza A (H1N1) virus that has infected humans in the U.S. and Mexico is a novel influenza A virus that has not previously been identified in North America. This swine flu virus is resistant to the antiviral medications amantadine (Symmetrel) and rimantadine (Flumadine), but is sensitive to oseltamivir (Tamiflu) and zanamivir (Relenza). Investigations of these cases suggest that on-going human-to-human swine influenza A (H1N1) virus is occurring. Although uncomplicated influenza-like illness (fever, cough or sore throat) has been reported in many cases, mild respiratory illness (nasal congestion, rhinorrhea) without fever and occasional severe disease also has been reported. Other symptoms include vomiting, diarrhea, myalgia, headache, chills, fatigue, and dyspnea. Conjunctivitis is rare, but has been reported. Severe disease (pneumonia, respiratory failure) and fatal outcomes have been reported with swine influenza A virus infection. The potential for exacerbation of underlying chronic medical conditions or invasive bacterial infection with swine influenza A virus infection should be considered. Persons with swine influenza A (H1N1) virus infection should be considered potentially contagious for up to 7 days following illness onset. Persons who continue to be ill longer than 7 days after illness onset should be considered potentially contagious until symptoms have resolved. Children, especially younger children, might potentially be contagious for longer periods. The duration of infectiousness might vary by swine influenza A (H1N1) virus strain. Non-hospitalized ill persons who are a confirmed or suspected case of swine influenza A (H1N1) virus infection are recommended to stay at home (voluntary isolation) for at least the first 7 days after illness onset except to seek medical care. A suspected case of swine influenza A (H1N1) virus infection is defined as a person with acute febrile respiratory illness with onset within 7 days of close contact with a person who is a confirmed case of swine influenza A (H1N1) virus infection. Close contact is defined as: within about 6 feet of an ill person who is a confirmed or suspected case of swine influenza A (H1N1) virus infection. Antiviral treatment of a confirmed case of swine influenza A (H1N1) virus infection, either oseltamivir (Tamiflu) orzanamivir (Relenza) may be administered. Recommended duration of treatment is five days. These same antivirals should be considered for treatment of cases that test positive for influenza A but test negative for seasonal influenza viruses H3 and H1 by PCR. Washing your hands often will help protect you from germs. Wash with soap and water. or clean with alcohol-based hand cleaner. we recommend that when you wash your hands — with soap and warm water — that you wash for 15 to 20 seconds. When soap and water are not available, alcohol-based disposable hand wipes or gel sanitizers may be used. You can find them in most supermarkets and drugstores. If using gel, rub your hands until the gel is dry. The gel doesn’t need water to work; the alcohol in it kills the germs on your hands.